Planning a production of “The Taming of the Shrew” is a fraught endeavor, especially for a woman-run theater. So it was intriguing to see how InnerMission Productions, co-founded by Carla Nell and Kym Pappas (and winner of last year’s San Diego Theatre Critics Circle’s Don Braunagel Award for Outstanding Work by a Small Theater Company) would approach the controversial, patriarchal, misogynistic Shakespeare comedy. The opener was promising: jettisoning the Induction, the often-omitted framing device that sets up the main action as a play-within-a-play, director Nell instead presented a video of archival shots highlighting the history of women’s rights, from suffragettes to working wives to shared parenting. So far, so good. The rest of the proceedings are presented as wildly broad and bawdy (exaggerating Shakespeare’s sexual references and innuendo, occasionally stepping over the line of good taste). The antics and declamations frequently veer way over the top. The uneven cast tends to over- or under-act, and the handling of the language is variable. Fortunately, at the center are two very capable performers. 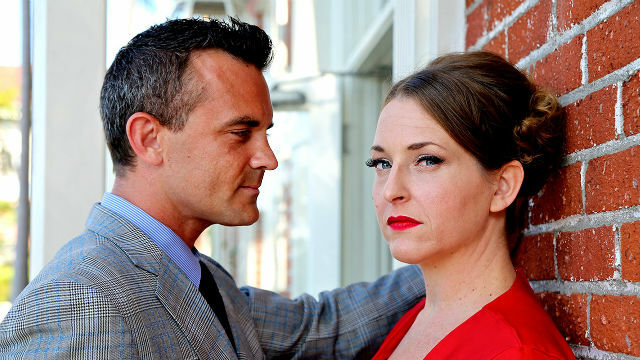 In her red dress, red lipstick and red stilettos, Kym Pappas is a formidable presence as Katherina, she of the sharp wit and sharper tongue. But perhaps her donning that getup while the video runs suggests that this is a “persona” she’s’ assuming? At the end, in the “shrew’s” famously submissive speech, after having been “tamed” by deprivation (winter days without food, sleep or heat), she is simply dressed, in flats, with no makeup. The submission she espouses, encouraging the other wives to be subservient to their “lord, thy king, thy governor,” comes across as flat and uninflected, spoken like a victim of Stockholm Syndrome, in thrall to her captor. There’s no wink-nudge glint of sarcasm here, as she counsels the other women to “place your hands below your husband’s foot.” She doesn’t seem to be in ironic collusion with her sometimes boorish gold-digger husband, Petruchio (Steve Froelich, at his worst in an apparently put-on “antic disposition”). But their two onstage kisses are ardent and lusty, so one assumes a strong mutual attraction. But the statement being made by that all-important final disquisition on wifely obligation and subjugation (he works, she stays home and luxuriates — and appreciates all he does for her) remains hazy. In the small, intimate space of Diversionary’s Black Box, the minimal design (Michael McKeon) is clever, and physical hijinks and reversals abound, including a female suitor for Kate’s more desirable sister, Bianca (Jamie Channell Guzman), and other gender-benders, in addition to all the disguises inherent in the original text. What “Shrew” never fails to do is get you talking (and get you seeing Shakespeare! ), and that’s a good thing at any time of year. Performances are Wednesday-Saturday at 7:30 p.m.